What ever happened to the very distinctive feature of the soup which is the beef that has been rubbed with lime juice or sour oranges and marinated between one and 24 hours before. Soup bones will definitely enhance the flavor of your soup Joumou. I did not have the courage to tell my friends that a Soup Joumou made of Chicken was not really a Haitian Independence Soup. However, I feel this should be brought in the open so that they will not continue to make the same mistake ant that others would no follow their footsteps by serving friends and families Soup Joumou mede of Chicken. This should not accepted by any Haitian and it should be denounced whenever someone witnesses this flagrant violation. Having Soup Joumou (Pumpkin Soup) with Chicken goes against all standards set or established for the creation of this prestigious soup. Let me come out and say will all my energy: "Haitian Soup Joumou is made with Beef". Marie-Claire Heureuse, the wife of the revolutionary leader Jean-Jacques Dessalines's wife, who initiated the Soup Joumou tradition is probably turning in her grave to hear that we are now substituting the beef in the Haitian soup of freedom with chicken. I think this should be included in the Haitian constitution. 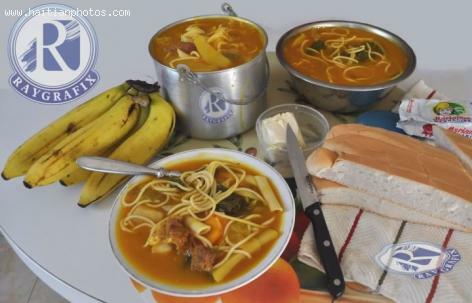 Any violation punishable by demanding that the person committing the offence to make Soup Joumou once a Month for the next 12 Months, inviting the entire neighborhood to come and drink the soup, free of charge. I agree with you soup joumou tastes better with beef (shin ring) Haitian in New York alsa has a bad habit of makng soup with yellow squash. This will never replace our joumou or pumpkin or kabocha.